Congress vice-president Rahul Gandhi said that Prime Minister Narendra Modi has always considered profit as the prime focus of the education system instead of providing quality education to the people. 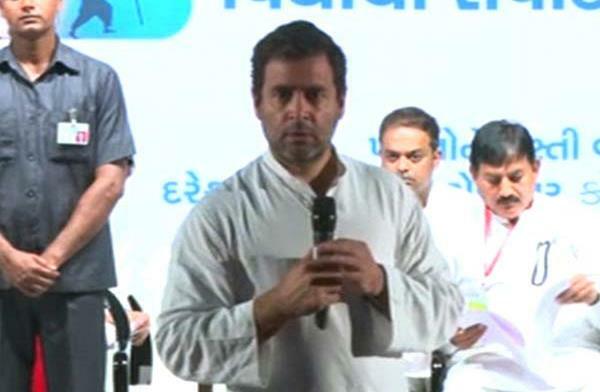 Vadodara: Congress vice-president Rahul Gandhi on Tuesday said that Prime Minister Narendra Modi has always considered profit as the prime focus of the education system instead of providing quality education to the people. "The goal of the education system is not to make profit, but to provide education. The former chief minister of Gujarat and the current prime minister of the nation, Narendra Modi, has always considered profit as the prime focus of the education system, instead of providing good quality education to the people. Hence, now the prime focus of the Congress in Gujarat is to bring back the focus of education on imparting knowledge. The marketing of Prime Minister Modi is pretty good," Gandhi said, while interacting with students at the Sayaji Hall, here. Commenting on the presence of women leaders in the Congress, Rahul said, "Why are there no women in the Rashtriya Swayamsevak Sangh (RSS)?" Rahul Gandhi also talked unemployment in the state and the country. "The UPA's records on the job are significantly better than the BJP. India has to focus on competing with China and focus on jobs in country. The Congress understands that. We take the country as a whole and believe in taking the country together," he reiterated. The Congress vice-president again targetted Amit Shah's controversy-ridden son Jay Shah and said, "Have you heard of Start up India? Have you heard about the icon of Start up India? The 'chaukidar' of India [referring to Prime Minister Modi] is quiet on this issue."